Choose gentle supplies. Think ‘gentle’ when you select brushes and combs for your toddler. A brush should be flat, rather than curved, and have bristles with rounded ends. If your child has tight, curly hair, the bristle should be long, firm, and widely spaced. A comb should have widely spaced, non scratchy teeth (check for smoothness by running the comb across your inner arm, which is more sensitive than your hand). A wide-tooth comb is especially important for children with extra-thick or frizzy hair. A detangling comb, specially designed for tight, curly hair, is also useful. 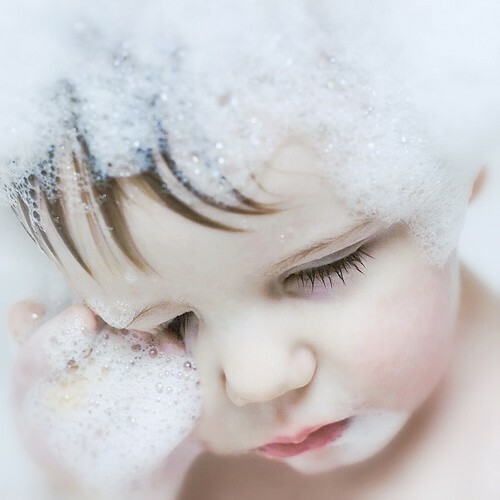 Think ‘gentle,’ too, when choosing a shampoo; a mild, no-tears formula that is designed for children is best. Shampoo/conditioner combinations save a step, which makes them perfect for shampooing a squirming toddler. Alternatively, use a children’s shampoo, instead of a conditioner that requires extra rising. Care for hair gently. Brushing helps to bring oil to the surface of the scalp and is particularly valuable for children with dry hair. But don’t brush hair when it’s wet; comb it, instead. Use a light touch when brushing or combing your toddler’s hair; avoid tugging or yanking. Detangle with a wide-tooth comb, working from the ends up, one section at a time; keep a bottle of spray-on detangling rinse around for resistant snags. To prevent hair breakage and loss, don’t pull hair tightly, whether unbraids, barrettes (clips), or ponytail holders, and never use regular, uncoated rubber bands (use only the soft -coated variety made for hair use). Because many children have hair that breaks easily, be especially gentle when brushing. Start at the nape of the neck and work toward the tips. Do small sections of the hair. Brush downward, rather than up, because brushing up is more likely to break the hair. Shampoo only as needed. Since oil glands on the scalp, like oil glands elsewhere, don’t become fully functional unit puberty, daily shampoos are rarely necessary, except for toddlers who tend to get a lot of food, sand, or dirt in their hair, or those who have particularly oily scalps. Many toddlers – especially, those with very dry hair or scalps – do will with only a weekly shampoo. Others require a shampoo every third day. More frequent shampooing is often needed in summer, when hair gets sticky faster. Be sure to rinse well; a soapy residue can become a magnet for grime. Don’t share when it comes to hair. Most of the time, the ability to share is an admirable trait to encourage in toddlers, but when it comes to hair care equipment, sharing isn’t a virtue. Each member of the family should have his or her own comb and brush and, to prevent transmission of head lice or other problems, should keep these to themselves. Combs and brushes should be washed weekly or every other week in suds made with a dash of shampoo and warm water. I am a hair dresser and I can’t stand shampoo and conditioner combos!! The conditioner never touches your hair. The shampoo is designed to wrap around any thing foriegn to it, what leaves your hair feeling like it is conditioned is fillers like waxes and other ingredients that cause build up and cause more problems for toddler. Your best bet is stick with 2 steps. You can use EVOO on the ends of the hair for the ends and just do everything else as normal.